Cubans are to be allowed unrestricted access to mobile phones for the first time, in the latest reform announced under new President Raul Castro. In a statement in official newspaper Granma, state telecom monopoly ETECSA said it would offer mobile services to the public in the next few days. Some Cubans already own mobile phones, but they have had to acquire them via a third party, often foreigners. 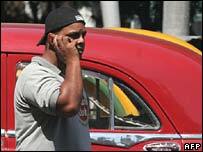 Cuba's rate of cell phone usage remains among the lowest in Latin America. Now Cubans will be able to subscribe to pre-paid mobile services under their own names, instead of going through foreigners or in some cases their work places. However, the new service must be paid for in foreign currency, which will restrict access to wealthier Cubans. ETECSA says the revenues will be used to fund telecommunications development in Cuba. Two weeks ago, a ban on a wide range of consumer electrical appliances was lifted, after Raul Castro said in his inaugural speech as president that he would act to ease some of the restrictions on Cubans' daily lives. Tight restrictions remain in place on internet access in homes and on foreign travel. Raul, 76, was selected as president in February, after the retirement of his ailing older brother, Fidel.